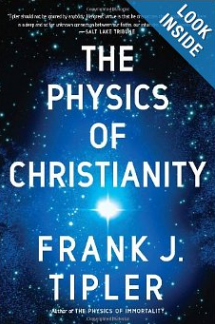 Anyway, the subject reminded me of Frank Tipler’s book, The Physics of Christianity. Why? 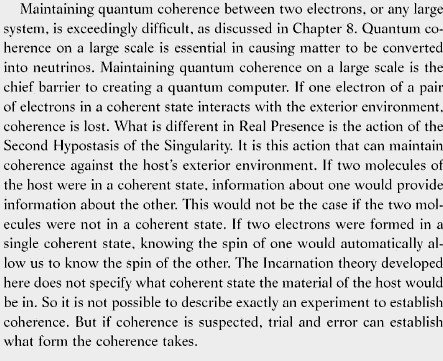 Well, as I recall, Tipler wanted to test a consecrated host to see if two molecules, once separated, say by the breaking of the bread, maintained quantum coherence – I guess the spin of electrons. Why this would happen with consecrated bread was something Tipler maintained was characteristic of the Second Hypostasis of the Triune Singularity that was God. Tipler wanted to scientifically determine who was right, Anglicans or Catholics. Yes, he wrote that in his book. What follows is a slight revision to something I wrote in late 2008. Frank Tipler, a Tulane University professor of mathematical physics does propose an interesting idea. He argues Christian doctrine is an expression of all cosmological reality as it can be described by modern physics: God is a triune singularity. The second hypostasis of this singularity entered history in our universe (and indeed in other universes of the multiverse) as God incarnate in Jesus for the sake of mankind. The miracles attributed to Jesus and other most other historical miracles are not violations of nature and are scientifically possible, even plausible. Two miracles in particular, the incarnation and resurrection, are indeed scientifically possible and, as Tipler sees it, essential for immortality. Yes, but. As an orthodox Christian, who like Tipler, has no issues with the theory of evolution or a universe that is thirteen-some billion years old or is but one of a seemingly endless number of universes, I found myself scoffing at Tipler’s assertions. It is important to remember that physical cosmology, like biblical exegesis and theology is controversial and unfinished. Even from certain facts and generally accepted theories, cosmologists, astronomers and theoretical physicists arrive at many different conclusions about the nature of reality. Tipler’s thesis is but one of many, something he recognizes. He simply dismisses all others out of hand by declaring everyone else wrongheaded. The theological perspectives Tipler offers on miracles, the virgin birth, the incarnation and the resurrection are well worth reading. The scientific explanations offered along with the theology are interesting so long as it is well understood that they are only possibilities. He speculates too much. Tipler’s scenario for the Resurrection is, well, interesting, or something. Jesus, he argues, may have dematerialized through a physical process known as baryon annihilation via electroweak sphaleron tunneling. By baryongenesis (what happened after the Big Bang) Jesus then rematerialized so that his followers would know he had been resurrected. The fly in the ointment is this: What if a terrorist or an accidental fire destroys the Shroud of Turin before we can figure out baryon annihilation. Is immortality doomed? It is hard to tell if this is possible in Tipler’s model, which is largely deterministic. Would a second coming of the second hypostasis of the cosmological singularity prevent this? And why is a scientific riddle embedded in the images on the Shroud? Why not an explicit set of instructions carved in stone? Is Frank Tipler a modern Hildegard of Bingenof? Her scientific visions in the 12th century were derived from the ancient Greek cosmology. Has Tipler turned the tables on those who think we should only believe what can be proved with science? If Tipler is right, some of us alive today will know it. Or we won’t. I don’t imagine that little children have much in the way of advanced knowledge in baryonic science or quantum physics. So maybe Frank Tipler hasn’t quite got all his theory right just yet. Incidentally, scientific determinism went out at the end of the 19th century with the discovery of quantum mechanics – it’s all probabilities! Clearly, Tippler is on the edge and his work is speculation. Frankly, I have to read it (in my spare time, Ha!) However, Dan, don’t forget Abramoff and his speculation on the relation of quantum mechanics to near death experiences. And then again there is Teilhard. Whether Tippler’s speculations are over the top is a possibility. But that he points the way to a direction that science and religion are heading, is another question. Science is treading on religious ground and has been doing so ever since science determined that Mauna Loa wasn’t a god but a volcano. Dare I write it again from the not so old but abndoned by the Vatican: “Love makes symbols real.” Thing is, I really believe that. Really!! Pardon my hang-up on the word “real” but it’s a quantum thing. Frank Tippler wrote a very interesting book, however there is no need to explain everything in terms of science. If he read the NT carefully he would quickly grasp the fact that Jesus described himself not only as someone different from the prophets but also from the rest of mankind! I believe you have a touch of Jansenist in you. Whatever your biblical exegesis. the fact is that the consistent position of the Church for a millennium or so is that Christ was a true man (among other things) and also a true God. portrait than with the “bodiless spirit” of gnostic tradition. Looks like you misunderstood me because what I stated is fully in keeping with traditional Christian teaching, agreeing with what the German scripture scholar Father Rudolf Schnackenburg meant when he said that Jesus “hovered” above the Gospels. You may know that Joseph Ratzinger/Benedict VI says in his “Jesus of Nazareth” that he began where Schnackenburg finished and he did a good job too. Yet there is much more he has to say, which he couldn’t say in the series about Jesus, because it is about science. He began this week by asserting that RD had written science fiction. Please, there is not even a bit of the Jansenist in me. They were more linked with the Calvinists, with their predestination and other issues, with which it is very difficult to agree, and I like biblical studies much more than theology because lately theologians have come up with many strange ideas. While systematic theology is essential for the science-theology dialogue there does not seem to be much consensus when it comes to theologians, in fact I had to tell one scientist-theologian friend of mine that it looked like they have to imitate the icon artists — who pray for inspiration before painting— before they write something. Regarding the quotation form Elaine Pagels, it is something one could expect since she had no choice but to say some things like that. At least she admitted what the orthodox thought and did, although she did not agree. There are top scholars, some of them at universities at your end, who have gone much beyond her. That is why your book will be interesting. When do you think you will finish? Shroud Encounter at Georgia Tech October 3 What did Jesus look like?